Snakes are misunderstood animals that serve as an important component of many types of ecosystems. All snakes are reptiles. Reptiles are ectothermic, which means they obtain body heat from their surroundings (also called cold-blooded). They bask in the sun to warm and seek shade to cool. They tend to be more active during the day in spring and fall, and more active early morning and evening during the heat of summer. Many people have a fear of snakes and snakebites. Most snakebites are a result of someone trying to move a snake by accidentally stepping on one. Bites from venomous snakes are very rare in Indiana. Indiana is home to 33 native snake species of which only four are venomous. Snakes flick their tongue in order to “taste” the air and ground. Particles picked up by the tongue are processed through an organ in the roof of their mouth called the Jacobson’s organ. Air temperature is the main factor in snake activity. They control their body temperature by basking in the sun. 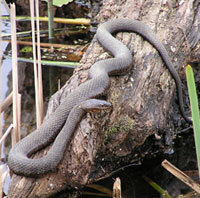 Snakes hibernate from late fall through early spring. Copperhead – Only found in southern third of the state. Cottonmouth – State Endangered – Only found in one small area in southwestern Indiana. Eastern Massasauga Rattlesnake – State Endangered, Federal Candidate – Northern third of Indiana. Timber Rattlesnake – State Endangered – South central Indiana. Oviparous – egg laying. Young receive nutrients only from a yolk sac. Viviparous – females gives birth to live young. Young receive nutrients solely, or in part, from the mother. Ovoviviparous – females give birth to live young. Embryos receive nutrients only from a yolk sac. In both viviparous and ovoviviparous species, the eggs lack a true shell. Instead, the young develop within a sac-like membrane inside the mother. Young of oviparous species have a leathery, flexible shell. 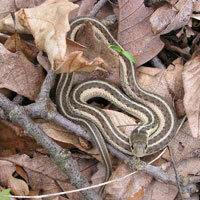 Females will lay eggs in leaf litter, rotten logs and mulch piles, or underground. Snakes swallow their food whole and have flexible jaws and joints in their skulls, which allow them to consume larger prey. Mammals – raccoons, coyotes, cats, etc. Why are Snakes Important for Ecosystems? Without snakes, the ecosystem could not survive. Snakes are important food sources for many animals, in turn, they also prey on animals and keep populations in check. When a snake sheds its skin it puts nutrients back into the soil. The biggest threats to snake populations are habitat loss, persecution by humans, overuse of pesticides, and collection of wild snakes by hobbyists and reptile dealers. REMEMBER: Most snakes are killed out of fear. If you leave a snake alone, it will leave you alone. When a snake bites a person, it does so in self-defense.